When it comes to choosing the format of a new installation, you can choose between flat signs like totems and flex faces, or dimensional signage with an element of depth to it. In some circumstances flat signs are the only option – for example construction site wraps and office window vinyls, where you need flat material to affix to a window pane or site fence. Commercial signs are often flat too, whether they are flex faces for over your entrance on a retail park, or standalone post signs. But in some installations, a sense of depth can be a good thing, and this is where dimensional signage offers some versatility – and in some cases, a sense of luxury too. Stone works are a great contemporary option, with the lettering engraved into the stone rather than printed on to the surface. 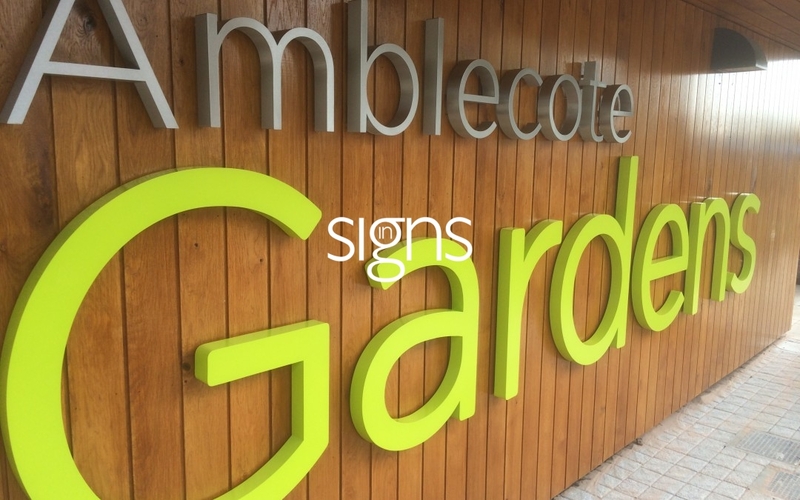 They are highly durable and well suited to large-format lettering signs, for example at the main entrance to a site from a busy road, or if there is a suitable stretch of empty wall alongside the front doorway to a building. An alternative to engraved lettering is to use built up lettering on a stone background, which also provides a feeling of depth. Built up letters don’t have to be used on stone though, and can create dimensional signage on wood, metal or almost any other surface. They can be affixed directly to most surfaces – and if electrical wiring can be run safely to the sign’s position, built up lettering can be illuminated at night for an effective round-the-clock sign too. Finally, an indoor take on dimensional signage can be achieved using acrylic directories, which typically have a black or white back panel, with lettered acrylic blocks fixed a short distance in front of this. Although this is not dimensional signage in the truest sense of the word, it still comes with an element of depth, and can make sure acrylic directories are an eye-catching part of your reception or lift area, rather than blending into the background.